Tessina cassettes are a snap to reload. If you have reloaded 35mm cassettes, you will feel right at home. The hardest part is finding a Tessina cassette. And like 35mm cameras, you only need one. They are a three-piece, plastic deal with a cassette body, a cap and a spool. The cap snaps on and off easily. The spool can be inserted in either direction. Tessina makes a special daylight loader which is nice but not necessary. We'll cover reloading the cassettes without the loader. Memorize these instructions since you can't refer to them in the dark; better yet, run through the steps with the lights on with scrap film. Gather all your items together -- 35mm film, Tessina cassettes, scissors, and film template. Wash your hands thoroughly, or use film gloves (obtainable at most camera shops) in order to avoid getting oil or dirt on the film. With the lights on, remove the cap and spool from the cassette. Completely check the cassette for any loose dirt or film scraps. Cut a length of film, using a template, ruler or whatever you can device. How long to cut the film depends on the thickness of the film. With typical B&W films you can expect to get about 16-17 inches in the cassette. With thicker color films, expect a little less. With thinner films, a little more. A yardstick with a notch or piece of tape at the appropriate distance will work fine. Slide one inch of film through one of the spool slots. Bend the end 180 degrees and slip it through the other slot. Wind the film tighly into a roll on the spool and pull out a 1-2" leader. Make sure that the emulsion in wound in toward the center of the roll. Slip the leader through the film outlet while dropping the spool of film into the cassette. The film slot can be difficult to find in the dark, so you may need to practice with the lights on with a scrap piece of film. Place the cap back on the cassette. Turn on a dim light. 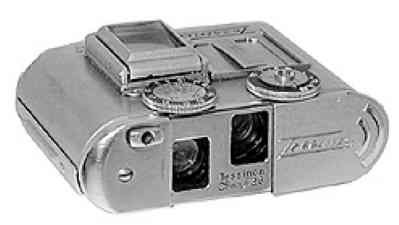 Check to make sure that the film is loaded correctly -- emulsion toward the lens and that the cap is secure. DO NOT CUT THE FILM TONGUE, like you do with normal 35mm film. Place the reloaded cassette in its protective case and mark the outside of the case with the type of film. If you don't have a cassette case, a 35mm case can be used. To use the film, slip the tongue under the tab on the take up spool and turn the spool with your thumb until the leader is secure. Don't try to advance the film with the motordrive. The motordrive will not catch the film until the camera back is in place.